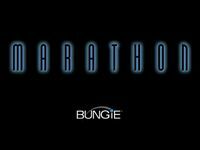 Marathon is a science fiction first-person shooter computer game published and developed by Bungie Software for the Apple Macintosh in late 1994. It is the first of three games in the Marathon Trilogy of the same name. It spawned two sequels, Marathon 2: Durandal and Marathon Infinity. Marathon takes place in the year 2794 aboard a large, multi-generational colony spacecraft called the UESC (United Earth Space Council) Marathon. The ship was converted from Deimos, one of Mars' two moons. The plot of the story sets the player as a security officer and focuses around an invasion of the ship and (to a much lesser extent) a colony on the nearby Tau Ceti by hostile extraterrestrials. The plot is primarily revealed through various computer interfaces called terminals, which relay crew logs, maintenance documents, historical accounts, and stories. It is through these terminals as well that the player receives mission information from Leela, the ship's artificial intelligence, as well as Tycho and Durandal, the science and utilities AI in Marathon respectively. The relationship between and history of these artificial intelligences serves as a significant plot device in the story. Source: Wikipedia, "Marathon," available under the CC-BY-SA License.